Love it or hate it, Aldi is here to stay. Since Aldi’s modest beginnings in 1976 America, this mega-cheap privately-owned German grocery store has infiltrated big city and suburbia alike, sending broke students, busy parents, and penny-pinchers into a happy frenzy. Aldi—Aldi South, technically, since Aldi North in America operates as Trader Joe’s—now boasts almost 1400 stores across 32 states, and last year, made $10.1 billion in America alone. Chances are, even if you’ve never strolled down those austere aisles, you’ve seen that no-nonsense blue-and-orange logo. This year, Aldi landed an impressive 14th place out of the 68 ranked grocery stores in Consumer Report’s survey of America’s best supermarkets, an annual report based on categories like customer service, cleanliness, selection of local produce, and price of organic foods, among others. Aldi scored lower than long-time faves, Wegmans, Trader Joe’s, and Publix, but higher than Whole Foods Market, while Walmart—the giant in the biz which, incidentally, can’t compete with Aldi’s killer deals—came out at the very bottom. The average American spends roughly $5,400 on food a year, but if you’re like me and further strapped for cash, Aldi’s 99-cents dozen eggs offer food prices that can’t be beaten. I want to respect my body—its needs and cravings—but I also want to support responsible business practices. So, how compatible am I with a store like Aldi? Is grocery shopping on a budget compatible with a happy, healthy, and honest lifestyle? Aldi-virgins, be forewarned: This store’s got a bit of a learning curve. When the first Aldi opened in my neighborhood last year, I made a point to stop in for my weekly groceries, but I came woefully unprepared. I started cold-sweating from the get-go: The quarter—needed for the coin-operated carts—which I didn’t have; the grocery bags—needed to pack your own groceries—which I hadn’t brought; the food labels—over 95% of the products are Aldi’s own phantom brands—which I didn’t recognize. By the time I made it to the cashier, I was a puddle of anxiety, frantically bagging groceries in reusable Aldi bags I had just bought, to keep up with the nice lady ringing me up at warp-speed. How is Aldi so cheap? Apparently, the secret’s in simplifying. Aldi claims it reduces costs for both the consumer and the environment by streamlining the shopping experience. Aldi has no free plastic bags (either bring your own or buy Aldi’s reusable kind), no loyalty cards, no phones in store (call your local Aldi, and you’ll be met by a machine directing you to their website), and they don’t accept credit cards or checks (no associated extra fees). They favor their own brands (so they can control their own price), carry fewer choices (only 1,400 compared to the average 30,000), which means stores tend to use less space. The smaller size compounded with the shorter hours (stores generally run, at most, 12-hour days), means it uses less energy, too. For better or worse, Aldi employs fewer workers. The average Aldi has around 3 to 5 employees in store at a time. In short, Aldi redistributes responsibilities we take for granted at other American grocery stores, like bagging, restocking, and gathering carts. Customers bag their own groceries, and shopping carts use a simple coin-deposit system—a quarter releases a cart, and you can retrieve it upon the cart’s proper return. Cashiers double as stockers. Rumor has it, they’re timed per sale, so that even with the typical single open checkout lane, there’s no real delay. Still, it’s hard not to be suspicious of such low prices, especially when the company and its founders, the German Albrecht brothers, are known for their thriftiness, reclusiveness, and secrecy. The secrecy’s a problem because we don’t know where products come from or how ethically it’s been handled along the way. It doesn’t help that in 2013, European Aldi’s beef supplier turned out to have used horse meat; and in June last year, Aldi’s shrimp supplier was discovered employing slave labor. Then there’s the question of working conditions. Back in 2009, hundreds of American Aldi store managers filed a lawsuit against the company for being unfairly denied overtime. Aldi is nonunion and although it’s generally known to treat employees fairly—with a slightly higher than average hourly wage and a seat at the register—it’s undoubtedly a physically demanding job. Aldi UK’s been elbowing out big-name chain competitors in the UK, which begs the question of how smaller grocery retailers have been holding up under the pressure. Aldi has around 4000 stores worldwide, and each country’s Aldi boasts different degrees of transparency about corporate responsibility on their respective websites. Battery recycling programs might exist in Australian and British Aldis, but it doesn’t show in the US. Unlike the Aldi-UK site, which identifies some local suppliers, the Aldi-US site makes it impossible to tell where any products originate. To Aldi’s credit, it’s not afraid to evolve with its customers. Aldi-UK launched a few Fairtrade options in 2011, which included coffee and chocolate. Early this February, Australian Aldi announced some new policies to step up its game in animal welfare across the supply chain. And in 2014, Aldi-US introduced SimplyNature, its own all-natural brand, and a few of these products have been third-party verified as GMO-free. Aldi offers a produce line with the USDA organic seal. It has committed openly to sustainability in its seafood products, and most recently, joined the Detox Movement, which commits to removing hazardous chemicals from their textile products and footwear by 2020. 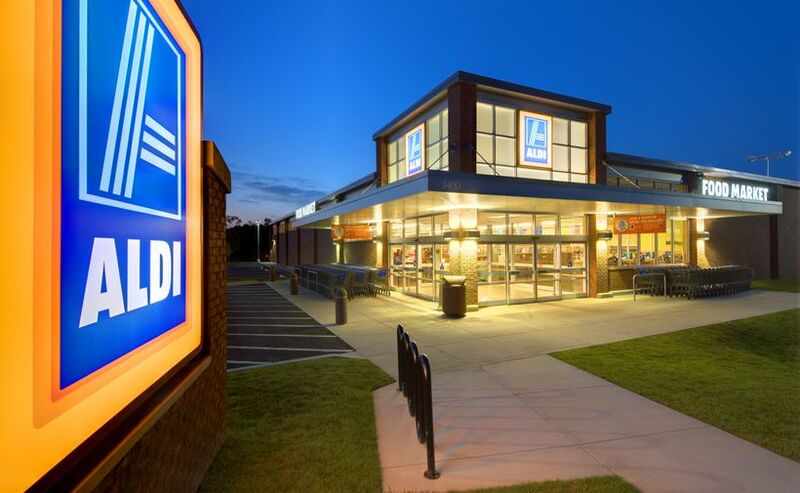 In January this year, an Aldi in Chicago announced plans to turn their current building more eco-friendly. Change at Aldi might be imperfect and slow, but for what it’s worth, they’re trying. I’m going to be honest: despite their lack of transparency, I’m still going to shop at Aldi. I appreciate the quality of life it affords me, savings which mean I can meet my dietary needs but also find the space to budget an occasional trip to the local farmer’s market. Now that I’ve been to Aldi a few times, I know where everything is. Gone are my cold-sweating days. The off-brands have grown on me. The lack of choice—gone are the days when I’d be agonizing between 20 different granola bars!—makes shopping easier. I like the employees. But the next time I go to Aldi, I’m going to ask questions. US Aldi’s phone-less stores and opaque website might make it difficult, but I can speak to a store manager, contact corporate headquarters, or write on the Facebook page. Historically, Aldi has made active attempts to improve based on customer response, which means our voice makes a difference. I suspect I’m not alone here: I’m just a shopper on a tight budget, trying to work through my own ethical boundaries and the compromises I can embrace without judgment, as I find new ways to live just a little closer to the ethical ideal. Ah-reum Han was born in South Korea and raised on the sandy savannas of West Africa. She’s been to five different continents, but learned to keep her feet still long enough to get her B.A. in Creative Writing and Cross-cultural Sociology from Carson-Newman University. She is currently a third-year M.F.A. candidate and thesis fellow in fiction at George Mason University.